The new simplistic or even ascetic design by Mathews combines forgiveness known from its predecessor Z7 with surprisingly low weight. Creed with its short A2A of only 30”, high speed, low weight and comfortable and forgiving 7” brace height is an ideal setup for a bowhunter. It is also highly praised for very smooth draw cycle which is due to application of advanced SimPlex Cam technology. Mathews Creed comes with the Geo Grid Lock riser known from from Heli-M. Its further improvement of the Grid Lock technology based on interlocking bridges connecting riser’s front and back edges and giving it extreme stiffness along with low weight. The recent improvement in this technology resulted in introduction of GeoGrid Lock riser bringing the weight even lower. Creed comes with either Walnut SlimFit Inline grip or Focus grip depending on the finish you choose. The first one is quite slim yet very comfortable. It has a distinct line at the back facilitating proper hand placement. Being made of wood it’s nice and warm in touch. Focus Grip is also slim and ergonomic with a line at the back. It’s made of rubber and there are several colors of this grip to choose from. 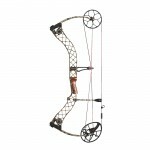 After extensive studies of efficiency Mathews decided to use split limbs with Creed making it the first single-cam bow in the history of this company with type of limbs. They are in parallel position and can be adjusted in the range of 50 to 70 lbs. The new SimPlex Cam that was used in Creed is made of 7075-T6 Aluminium which makes it extremely strong and lightweight. Due to its shape the draw cycle is very smooth. The efficiency is further increased by application of sealed bearings which minimize friction. One can choose a draw length in the range from 26” to 30”. The draw length can be adjusted in half-inch increments. It is possible to mix the first two together. The Tactical finish is often slightly more expensive and features Focus Grip instead of Walnut SlimFit present in Black and Lost Camo versions. Further customization can be achieved by changing colors of the dampeners and rubber of the grip (Focus Grip). Any string oscillation after the shot are captured by the Dead End String Stop Lite which is a lighter but equally effective version of Mathews Dead End String Stop. Riser vibrations are deadened by two dampeners, one on the top and one on the bottom of the riser. The upper one is Mathews Harmonic dampener while the lower one is its lighter version, Mathews Harmonic Dampener Lite.